These plans are instant download - you will need to print the 22" x 34" sheets.. For printed plans, click HERE. 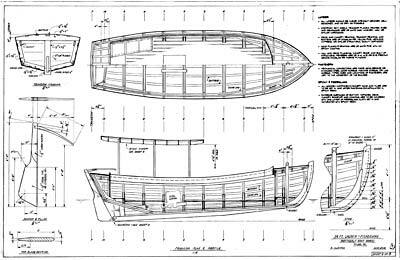 The drawings consist of: Sh’t 1 – Lines Plan and tables of offsets (imperial & metric); Sh’t 2 – Framing Plan & Profile, plus details of rudder, tiller, stem post, and transom framing; Sh’t 3 – Framing Sections & details; Sh’t 4 – Rigid Canopy & details; Sh’t 5 – Orthographic Illustrations of the finished boat. If you order paper copies of the plans you will receive two sets of the 5 drawings =10 ea 22” x 34” prints. 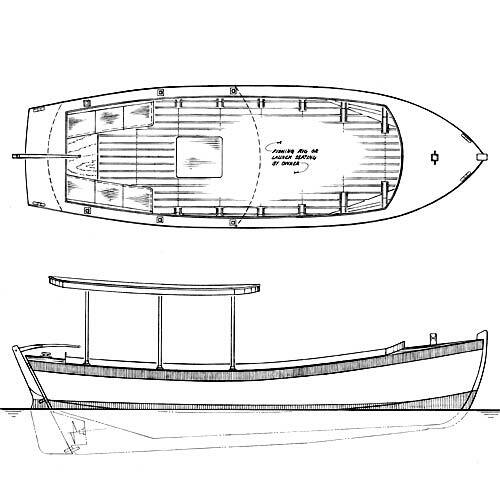 The design follows classic ‘Chesapeake deadrise’ principles, but with added stability provided by the deeper sections aft. The fine entry assures that she’ll ride comfortably and dry in a choppy seaway and gently flaring bow and quarter sections provide ample reserve buoyancy and load carrying capability. A 2 cylinder diesel engine (15-20hp) will push her merrily along at her 6-knot hull speed. Traditional single-chine construction methods are employed, with multi-ply plywood hull and deck planking; and, to simplify bending of thick-sectioned longitudinal structural members, ‘built-up’ plywood laminations find excellent application. All wooden components are set in and coated with epoxy resin, and hull and deck exterior surfaces are covered with one layer of fiberglass cloth. NOTE: This boat has not been built. If you decide to build her, and send me construction and finished-boat photos, I’ll be glad to refund your cost of the plans.